Members of The Mountain Times gather around “Best Ad Designer” Maxx Steinmetz, who holds up two first place awards won at the Advertising, Circulation and Marketing awards ceremony in Boston, Friday, Feb. 20. Pictured (l-r): Jason Mikula, Erica Harrington, Lindsey Rogers, Maxx Steinmetz, Polly Lynn, and Kyle Finneron. The Mountain Times, a media company based in Killington that covers community news and events in Rutland and Windsor Counties, was recognized for its excellence in design and marketing during the Better Newspaper Competition held Friday, Feb. 20, in Boston. 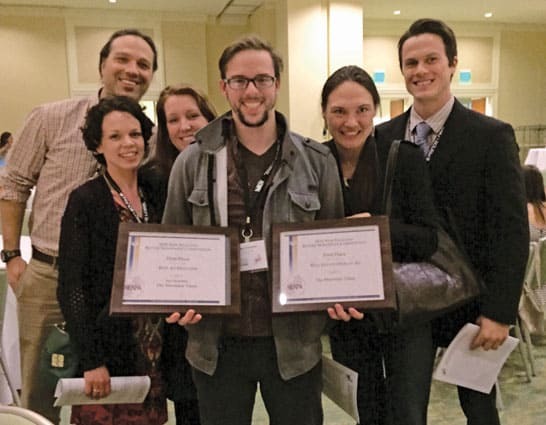 In total, The Mountain Times took home four awards. Advertising awards included: first place for “Real Estate Display Advertisement,” and third place for “Best Advertiser Campaign.” On the editorial side, The Mountain Times won first place for “Education Reporting,” (an award Mountain Times Editor and Co-publisher Polly Lynn shared with other Lynn Publication editors who collaborated on the piece, including Courtney Lamdin, Michelle Monroe, Lee Kahrs, and John McCright). The most prestigious award won, however, was the “Graphic Designer of the Year” award, which was presented to Maxx Steinmetz. A full list of awards won by other Lynn Publications media outlets is listed below. Lynn Publication newsgroup includes: The Reporter, The Addison Independent, Vermont Ski & Ride Magazine, Vermont Sports Magazine, The Essex Reporter, The Colchester Sun, Milton Independent and St. Alban’s Messenger in addition to Freedom Publications, Route 802 and LocalvoreToday.